Are you considering installing new laminate floors in your home? We’re sure that decision comes along with a number of questions and things you need to know before purchasing. That’s why we’ve put together this list of answers to your laminate flooring questions. From what laminate flooring is to its lifespan and the best installation methods, we’ll answer all of your top questions in this blog post! If you have any other questions about laminate flooring or our other flooring collections, reach out to us on social media! Laminate flooring is comprised of multiple materials fused together through a unique lamination process. Laminate floors have come a long way from the plastic-looking floors of the past. While many people believe that hardwood is the flooring of choice, today’s laminates have evolved to include innovative technology that provides beautiful, worry-free durable flooring that offers the natural wood looks that everyone wants. The top finishing layer includes a transparent, wear-resistant finish that is highly resistant to stains, wear, impact, scratches, burns and household chemicals. Laminate’s durability makes it a good choice for active households, especially those with pets. 2. How Good Does It Look and How Long Does it Last? Every TORLYS laminate floor is gorgeous; the collection features a wide range of “grains” that are virtually indistinguishable from hardwood. 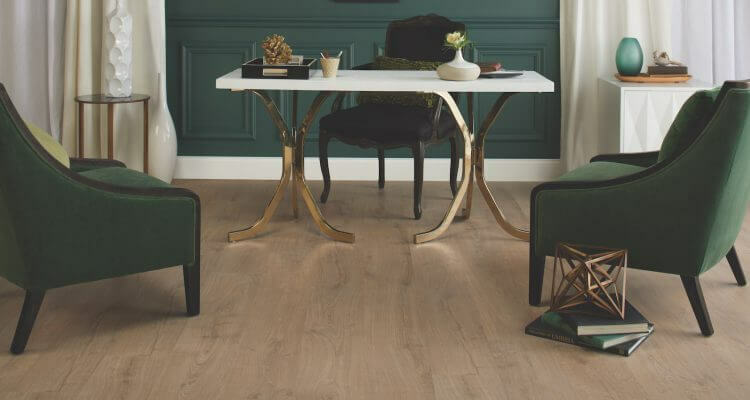 TORLYS’ Envique laminate collection features bevelled edges and an Embossed-in-Register (EIR) texture that gives the floor a more realistic wood appearance and texture. You can choose from a variety of unique hues, such as Woodland Oak and Summer Pine. Laminate will give you the look of hardwood and outperform it as well. 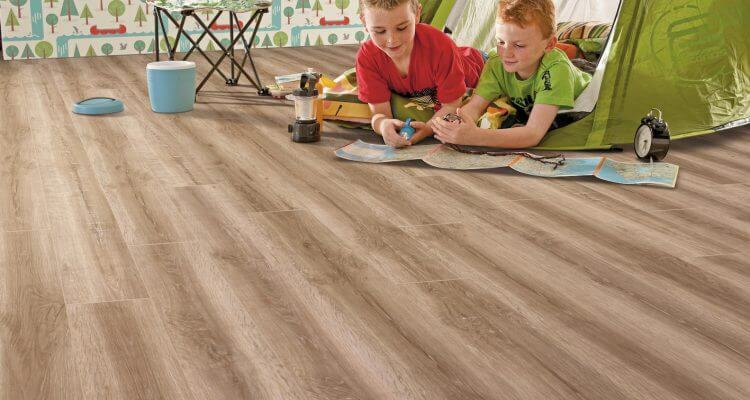 TORLYS laminate flooring provides the utmost flexibility and is extremely durable—it will stand up to traffic, kids, and pets. You’ll be able to create a statement in any room while benefiting from a floor that will endure. 3. How is Laminate Flooring Installed? There are two options for installation: flooring retailer or DIY. All TORLYS floors are designed to be easy-to-install. No matter which option you choose, installation goes smoother thanks to TORLYS patented Uniclic® joint technology. However, if you’ve never installed flooring before, or only have a few DIY jobs under your handyman belt, it’s best to hire flooring retailer to do it for you. Dealers are experienced and come with all the tools for the job. Before installing a finished floor, you need to take care of your subfloor first by securing loose planks and fixing damaged sections. If you don’t, it could affect the quality and performance of your laminate flooring. The subfloor also needs to be level. A subpar subfloor can result in a finished floor that is loose and squeaky. It can also cause your new laminate floor to cup and gap. If your subfloor is in poor repair, it may cost more than you want to spend to fix it, but it’s worth it. 4. How Large of a Space Can Laminate Be Installed in? You can install laminate flooring in any size of room, but some laminate floors require transitions to reduce gaps in larger spaces. That’s not the case with TORLYS smart laminate, though! Thanks to advances in flooring technology, TORLYS smart laminate floors can be installed transition-free in spaces up to 50′ x 50‘*! * transition-free installation does not apply to the Lexington laminate collection. That means that if you have a large home with an open floor plan, you won’t need to install any speed bumps like transitions or mouldings to cover gaps. TORLYS smart laminate floors can also be installed through doorways and archways without transitions or mouldings. How great does is that? Just read TORLYS installation instructions on our website for complete installation details. 5. How Much Does Laminate Flooring Cost? When it comes to laminate flooring, the saying “You get what you pay for” is extremely accurate. The price range varies for laminate—it can cost between $1.50 to just under $7.00 per square foot. The cheaper the laminate, the cheaper the materials that went into making it. Don’t be fooled by looks either. Most laminates look very good when first installed, but it’s how the laminate performs over time that matters. Less expensive laminate doesn’t last as long as quality laminate. It will also be more prone to dents, scratches, warping, and cupping. 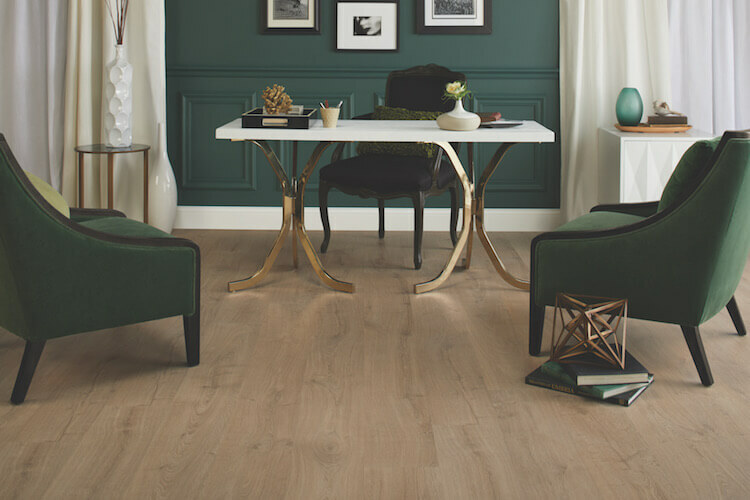 TORLYS laminate is more expensive than $1.50 per square foot, but it’s designed to last decades and has the lifetime warranty to back it up. Before you decide on a cheaper laminate floor, ask yourself if you want to replace your floor in a few years. 6. How is Laminate Flooring Maintained? TORLYS laminate flooring does not need any special cleaners or treatment at all! We do recommend a TORLYS Natural Glow cleaner, but you never need to wax or polish it. While you can’t refinish a laminate floor, TORLYS laminate features a hard, durable surface that is water, stain and fade resistant. Its super-strong surface also protects against scratches, but should your floor sustain any damage, restoring a TORLYS floor is easy compared to other floors. 7. Is it Easy to Repair Laminate Flooring? You can quickly and easily repair minor scratches in TORLYS laminate floors by using a TORLYS touch-up kit. For irreparable damage, TORLYS Bulldog Easy Plank Replacer allows you switch out damaged planks, eliminating the need to replace your entire floor. If you’re questioning whether a scratch is reparable or not, don’t hesitate to reach out to your TORLYS dealer and request a site visit. 8. Which Direction Should You Install Laminate Flooring? When you are installing new laminate floors in a room, you should install them parallel to window light. This will make the room look larger and make the floors look natural in your home. Now… this instruction may sound a bit confusing. What we mean is to start laying the planks of your floors along the same wall as the main source of natural light, as in the photo above. If you are installing the same laminate flooring throughout your entire home, start at your front door. Your floors should run perpendicular to your front door, and in the same direction through your home. This will make your entryway look longer, and create a cohesive look in your home. If you switch directions of flooring installation in each room, it will make your home look broken up and unintentional. 9. How Do You Lay Laminate Flooring? This is one of the most-asked laminate flooring questions. Like we said earlier, laying laminate flooring is best left to the professionals to reduce the risk of gaps and improper installation. For all you DIY fans, we will be sharing laminate installation tips in a future blog, so stay tuned for that. In general, you should use boards from a number of boxes of laminate flooring to ensure a mix of colours and shades. 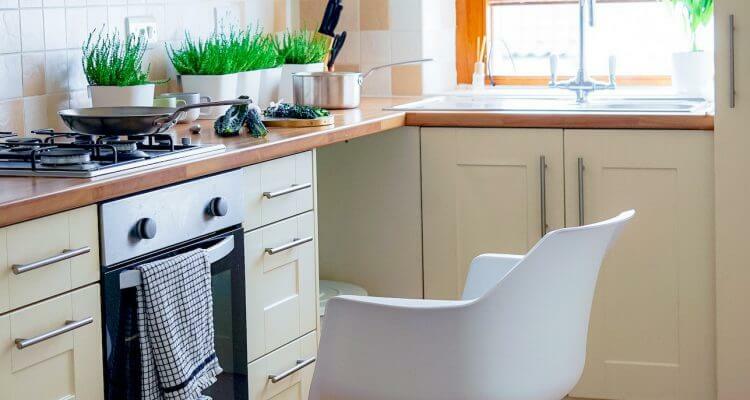 This will prevent your floors from looking too chunky or having large variations in colour throughout the room. We hope you learned something new about laminate flooring from this blog post! If you have any other laminate flooring questions, be sure to send us a message on Facebook, Instagram, or Twitter. 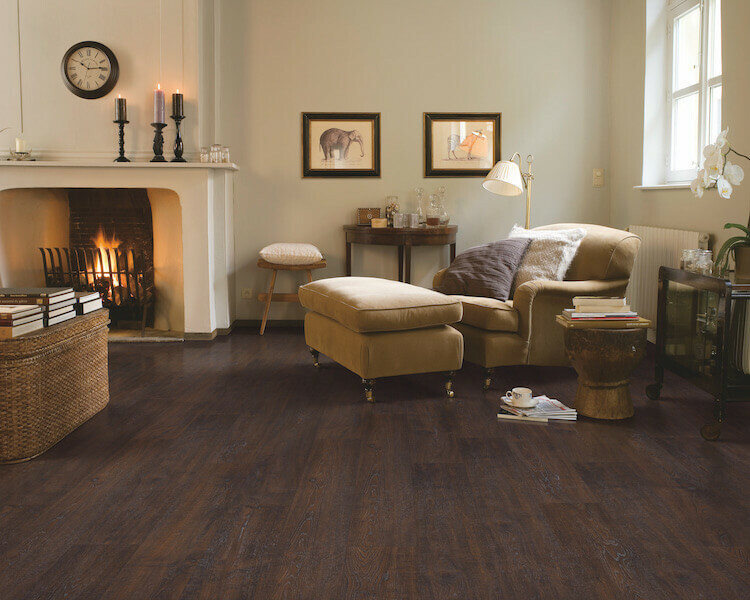 To bring TORLYS laminate flooring into your home, stop by your local TORLYS dealer to see our beautiful floors in person!